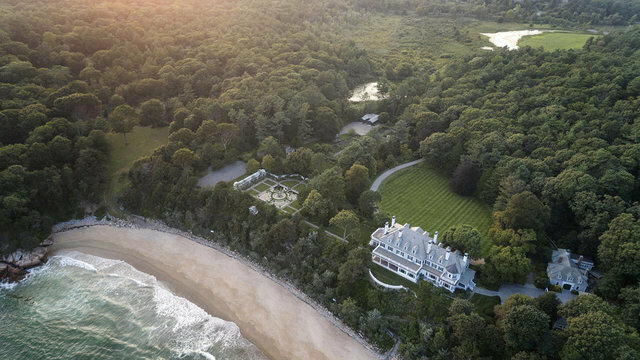 The Chimneys represents a once-in-a-lifetime opportunity to acquire a pristine 28 acre oceanfront estate. The Rhododendron-lined driveway winds through woodlands dappled in sunlight to arrive at a sanctuary of privacy and peace. The 13,000 SF, 12 fireplace, eight-bedroom home commands a bluff above the Atlantic, awash in horizon-to-horizon seascapes. Below, a sweeping, white sand beach is privately accessed by just seven families. Refined sensibilities prevail throughout the residence: an elegant Dining Room with hand-painted Chinese wallpaper; a Living Room that leads to the oceanside porch; a Music Room with views on three sides; a custom Kitchen with a wood-fired oven and grill; a Master Suite with a mahogany Dressing Room; Guest Rooms that visitors will find memorable. The restored 1906 Frederick Law Olmsted, Jr. gardens offer hours of quiet tranquility. A 4000 SF Carriage House can accommodate a car collection, be furnished as an office or become a family party space; the two-bedroom apartment above serves senior staff or summer guests. The Chimneys is private, but not isolated: five minutes to charming Manchester-By-The Sea, 18 minutes to the (rarely fogged in) Beverly Airport; and 40 minutes by car or train to historic Boston. For 175 years, just three families have owned this remarkable property and, for 117 years, only two families have lived at The Chimneys. A chance to become the next steward of this singular estate is unlikely to happen again for many decades.